CINCINNATI (March 4, 2019) – ProAmpac today announced it has developed a suite of sustainable product groups as part of the company’s commitment to increasing environmentally sound and sustainable flexible packaging solutions. “We are advancing our corporate commitment to deliver and develop the sustainable flexible packaging that our customers and their consumers want and need,” said Adam Grose, chief commercial officer. The company will be at the Natural Products Expo West show March 6-8 at booth N-1817 in the Anaheim Convention Center. ProActive Recyclable – Unique, high performance products which can be processed after use through typical plastic recycling streams. 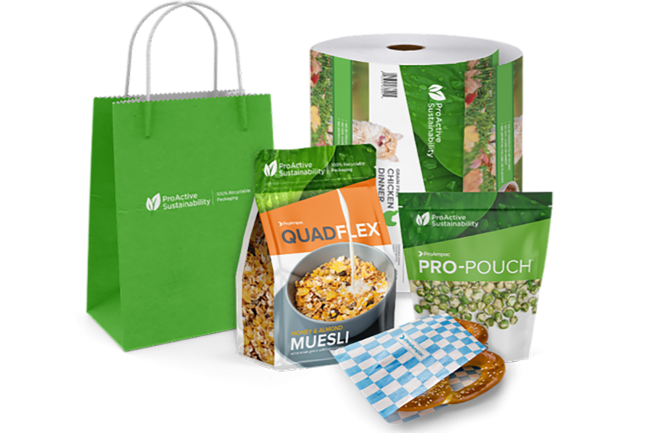 ProAmpac offers recyclable products such as stand up pouches; quad seal pouches; rollstock for form/fill/seal applications; sandwich wrap; retail handled shopping bags; lawn & leaf bags and more. ProActive Compostable – Products which biodegrade in industrial composting facilities per conditions set by ASTM D6400. ProAmpac is able to work with customers to incorporate compostability into their paper packaging offerings. Compostable packaging is an attractive sustainable offering when combined with compostable products, such as yard waste or food. ProActive Renewable – Products which are made from a bio-based feedstock, such as corn or sugarcane. ProAmpac has renewable options available including large format bags for the lawn and garden market. ProActive PCR – Products which contain Post-Consumer Recycled (PCR) plastic from a non-virgin, recycled plastic resin sources. ProAmpac is able to incorporate PCR into materials to meet customer sustainability and carbon footprint reduction goals. The company’s ProAmpac Sustainability™ policy means being a good neighbor and looking to the future. Using advanced technology, ProAmpac is developing and innovating sustainable flexible-packaging products. By reducing energy use and the environmental impact of its facilities, ProAmpac is engaging employees, collaborating with suppliers and customers, and teaming with neighbors to make the communities in which we operate, as well as the packaging we make, even better.